- Couple cloves of garlic. - Large brown onion, maybe a couple. - 750 grams of lamb chunks. Cubed to about 2.5 cm. - Mushrooms, mushrooms, mushrooms, roughly chopped. Quantity, ~1½ times the volume of the meat. - Handful of fresh thyme, oregano. - Frozen filo pastry (thawed). About 12-15 sheets. Can't remember exactly how may sheets I used. The pie filling is a none issue, experiment with whatever you fancy, I would make a purely mushroom version for my sister who is a vego. Left over bolognese sauce, go for it. Wash it down with a stout or porter beer. On the Stove 1. Sauté onions and garlic in a cooking pot. 2. Add lamb. 3. Add the mushrooms, herbs. Cook until reduced. Add a little stock or water. 4. Cover and allow to slowly simmer. Meanwhile on the bench 5. I use a deep baking dish small enough so when I place a pastry sheet into it, half the sheet will hang over the edge. So all I have to do is fold the sheets over to cover the filling. 6. In a small bowl, mix equal parts milk to olive oil. This will be used baste layers. Don't stress if it doesn't emulsify. 7. Place the first filo pastry sheet into the baking dish with half hanging out. Using a kitchen brush or teaspoon, evenly (and liberally) baste the part of pastry which is inside dish. 8. Place next sheet on top, repeat basting, repeat for all the sheets. From the stove to the bench. 9. 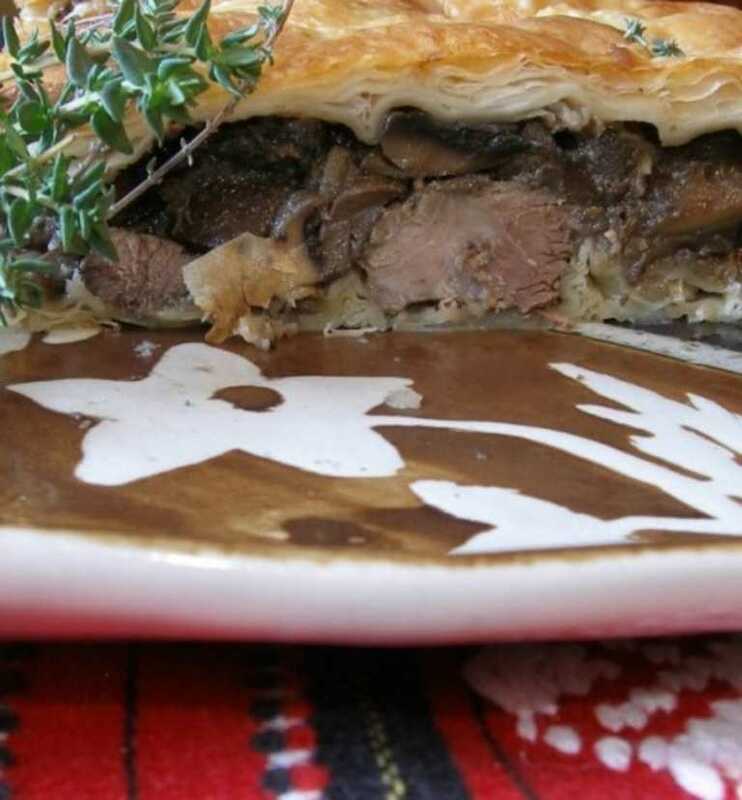 When lamb has cooked, pour straight over the pastry. 10. Start folding in each pastry sheet, again basting each layer. The pie filling hopefully should now be fully covered on all sides. 11. Once finished, pour oil/milk mix over top making sure some of it gets down the sides of the pie. 12. Using a fork, poke a few holes in the top . In the oven. 12. Pre-heat oven to ~200°C. 13. Bake pie for about 25 minutes, baste once more while baking. Bake until the top is crispy golden. Out of the oven. 14. Leave to cool and consume.